Stalk the media you pitch – in a non-threatening way, of course! Get to know your contacts’ interests and beats as well as how they like to receive info. Don’t stop at Cision! Make sure you study their recent stories, check out their Twitter stream, and look for recent interviews or profiles. If you’re aware of personal interests or hobbies, why not send them something completely non-client related? Leverage other news – Dig for connections to use current events to your advantage. A client recently had a store opening in record-breaking weather on a Saturday, which isn’t ideal for news crews, but since the store was indoors (in welcome air conditioning), another angle was developed! Be flexible and remember sometimes the story you start with is not the one that will most interest the media. Develop genuine enthusiasm – So you’ve got someone on the hook and you’re tempted to recite your verbal pitch… but don’t! Get genuinely excited (and knowledgeable) about your client and their story so you can discuss the details with the reporter and make them see why they should care. But remember enthusiasm does not mean speed-talking and an exclamation point after every word. If at first you don’t succeed…. – You’ve exhausted your resources and think it’s over. Try once more. Some reporters, especially TV assignment desks, wait until the last minute to finalize plans. Others may just need a timely nudge. If it’s a pitch with an expiration date, use every minute you have. 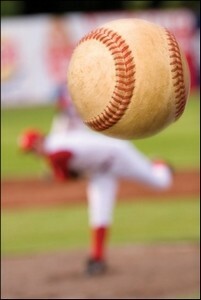 How do you prepare to pitch “perfectly” so you can have a media home run?